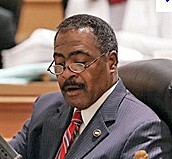 Representative DeBerry may get an opponent; country commission may get a final map. 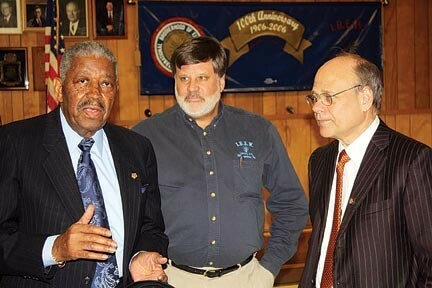 Howard Richardson (left), with Paul Shafer of the IBEW and Rep. Steve Cohen • Howard Richardson, a former president of the Shelby County AFL-CIO Labor Council and a prominent member of the Shelby County Democratic Party, died Sunday at the age of 81 after a lengthy illness. Richardson, a well-liked figure across factional and even party lines, was active in numerous political campaigns, and his South Memphis home was a familiar location for political rallies and social gatherings. A former international vice president of the Hotel Employees and Restaurant Employees Union, Richardson had also been chairman of the NAACP Labor and Industry Committee. He had recently retired as an officer for the Shelby County Democratic Steering Committee. At press time, funeral arrangements had not been released. The dislocations caused by the most recent legislative redistricting continue to proliferate. Most recently, John DeBerry, a Democrat who for several years has represented District 90 in the state House of Representatives, may have found his revised contours uncomfortable both for himself and for significant numbers of his new constituents. DeBerry's south-central Memphis district remains, as before, reliably Democratic, but it has expanded eastward from a largely African-American area, religious and working-class in nature, into several Midtown neighborhoods that contain a population that is relatively whiter, more middle class, and decidedly secular-minded. Or, to quote one of DeBerry's new constituents, Jonathan Cole of the Tennessee Equality Project, "I now live inside District 90 ... redrawn by the Tennessee General Assembly ... to include the neighborhoods of Cooper-Young, Central Gardens, Vollintine-Evergreen, Annesdale-Snowden, and Chickasaw Gardens. These Midtown neighborhoods contain a number of gay and lesbian voters and other progressive voters who support equality for lesbian, gay, bisexual, and transgender people and their families." In a letter dispatched to residents of the area and other supporters, Cole declared, "DeBerry's voting record is out of step with constituents in the new District 90." He cited the representative's recent vote for HB0229, informally known as the "Don't Say Gay" bill. Sponsored by Republican state representative Stacey Campfield of Knoxville, the bill would place restrictions on references to homosexuality in public schools. Citing other officials now representing the area, like Congressman Steve Cohen, city councilwoman Janis Fullilove and city councilman Lee Harris, who vote for or make a pledge to support LGBT equality, Cole said, "I am writing to ask for your commitment to help raise funds for a candidate who will represent the progressive values of Midtown. While no candidate has been identified yet, the district is rich with viable progressive candidates for the primary or general election. We need at least 50 households to commit to raising $1,000 each to make it happen by June 1st. We also need to identify the best candidate to represent the values of District 90." • Although observers of the currently configured Shelby County Commission have learned not to take anything for granted from what has been a famously discordant body, it appears that there may, after all, be nine votes — the number ultimately required — for a plan to redistrict the commission in conformity with the 2010 census. In any case, there were nine votes on Monday for Plan 2J, one of an almost infinite series prepared at this or that commissioner's behest by the indefatigable Josh Whitehead of the Office of Planning and Development. Plan 2J posits 13 single-member districts, of which seven have a significant African-American majority. Monday's was the second of three compulsory votes required for passage of the plan, which is due for a final vote on March 12th. What made this week's outcome possible was the somewhat unexpected conversion to the plan of Republican commissioners Heidi Shafer and Chris Thomas, both of whom had previously been advocates for what was called a "continuity" plan — essentially an update of the current districting model of four three-member districts and one single-member one. The adjective "somewhat" is key, inasmuch as both Shafer, an East Memphis resident, and Thomas, who lives in suburbia, may have signaled their intent on the occasion of the first reading of 2J two weeks ago, when each of them abstained. Another crossover was Democrat Melvin Burgess. On the other side of the scale, Democrat Henri Brooks, who had voted for 2J on its first reading, voted against it this time — mainly because she had come to favor another single-member variant, 2L, which allowed for eight majority-black districts, a proportion she thought more representative of population trends. Should the apparent nine-vote super majority hold on March 12th, the commission will conclude a process that other legislative bodies had already concluded some time back. Should some new hitch develop (and Commissioner Brent Taylor on Monday proposed an alternative with single-member districts and super-districts on the model of the Memphis City Council's districts), the issue may well have to be settled by Chancellor Arnold Goldin, who has deferred acting on some existing litigation pending the possible resolution of things by the commission itself. U.S. District judge Hardy Mays may have cleared the way for Plan 2J by his ruling, during a conference with commission members two weeks ago, that a vote by the commission itself was all it took to expand the soon-to-be new Uniform Shelby County School Board from seven members to 13, which could be made identical in outline with 13 commission districts. Some questions apparently remain, however, as to how the forthcoming August elections for seven school board members might be affected. • Early voting for the March 6th election, which includes a presidential primary as well as primaries for various county offices, was extended this week to the satellite locations mentioned in last week's column. Election Commissioner Norma Lester this week dispatched a reminder to voters with this helpful advice: "It is ... imperative that voters are not confusing the voter ID law with the state voter ID. Acceptable documents are current or 'expired' driver's license, passports, any form of federal ID, state ID or similar ID from another state. All of which MUST have a voter picture. Voters are not entitled, do not need and will NOT receive a free voter ID if they have any of these documents. Anyone bringing an expired picture ID that meets these requirements will be allowed to vote. "All registered voters will be allowed to vote at the polls; however, without required document, voters will be offered a provisional ballot if they opt out of returning with document needed. Once a provisional ballot is filed, voter is no longer eligible to vote via the machines (this would result in a voter voting twice). Provisional ballots are counted in the certified totals."